As someone who’s played more Dragon Warrior than any other deck, it made me extremely happy to see the Dragon master himself, Brian Kibler, showcase its strength on his stream a few days ago. His list is a bit different than the one I’ve been having success with, but I’ll defer to his expertise for the sake of this article. Dragon Warrior is, at its core, a variant of Control Warrior that gets access to some slightly different tools. 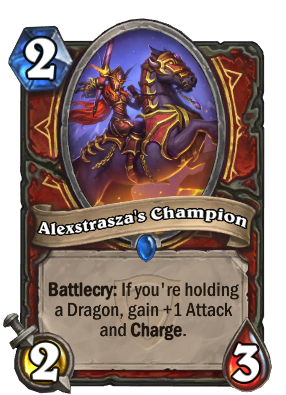 There’s no question that a well-timed Blackwing Corruptor can completely swing the tempo of the game, while Alexstrasza’s Champion is an incredible early game minion, something traditional Control Warrior generally lacks. If you like control-based decks but want something a little bit out of the ordinary, this just might be the deck for you. As I mentioned in the opening, this card is one of the main reasons to play the deck. While traditional Control Warrior’s only strong early minion could be something along the lines of a Zombie Chow, Dragon Warrior has access to a 2 mana 3/3 with Charge. It can trade with just about any early minion from your opponent, while sometimes even surviving the encounter. On an empty board, it’s an instant 3 damage to your opponent that demands an answer. This is the card that helped enable a variety of Dragon decks post-TGT, and it’s right at home here. In a Control deck, a 4 mana 3/6 Taunt is an extremely valuable minion. As a bonus, while it works with Dragons, it’s also a Dragon itself, helping to enable other Dragon-reliant minions. It can take up an entire turn against an aggro deck, as they have to sacrifice resources just to remove it from play. 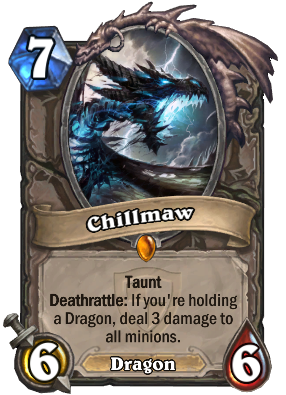 Speaking of anti-aggro, few cards embody that theme as well as Chillmaw. A 6/6 with Taunt can already be difficult for some decks to deal with, but if you have a Dragon in hand, the Deathrattle will absolutely devastate your opponent’s board. Even if you’re not holding a Dragon, your opponent will usually have to play as if you do, often forcing them into bad trades. Chillmaw is still decent against other control decks as well, but truly shines against aggro. Rend is there for you in times when Big Game Hunter isn’t. BGH can’t do anything to a Tirion, but Rend can take care of Mr. Fordring instantly. Loatheb, Emperor Thaurissan, Archmage Antonidas, Ysera…the list of things Rend destroys goes on and on. 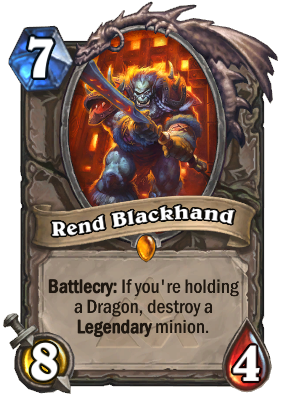 The 4 health does mean it’s unlikely that he’ll stick around to be able to attack, but even if your opponent uses something right away to remove Rend, that’s still a 2-for-1 trade in your favor. If he does stick, that’s 8 damage coming their way. When Kibler was first showing off the deck on stream, there were many who were questioning his choice to play Onyxia. Those viewers had their answer once they saw him play it once or twice. The potential 15/15 worth of stats for 9 mana was extremely difficult for opponents to deal with, and often made the difference when both players had exhausted most of their resources. 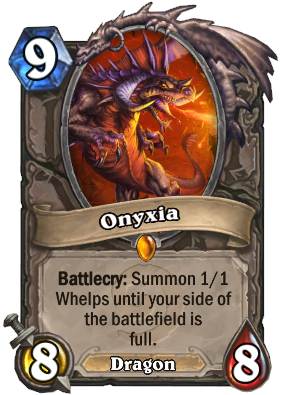 In a game where you make it to turn 9 but are running out of steam, Onyxia can get you back in the game more effectively than something like Nefarian can. This is a control deck, and needs to be played as such. Your goal should be to get good trades early, before out-valuing your opponents in the late game. 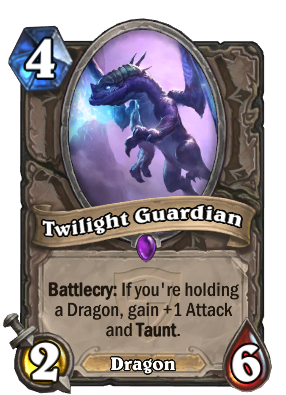 Because some of your key cards rely on holding a Dragon, it’s not always wrong to keep something like an Azure Drake in your opening, if you’re also holding an Alexstrasza’s Champion and Twilight Guardian. Don’t be afraid to bluff with Chillmaw if you don’t have a better play. A 6/6 Taunt is still a decent body, and unless your opponent knows you don’t have another Dragon, they’ll still be forced to play around the Deathrattle. With Dr. Boom, Rend Blackhand, Onyxia, and Grommash Hellscream, you have a lot of targets for an opposing Big Game Hunter. Because of this, if you get to late game in decent shape, chances are good that a single top-deck won’t be enough for your opponent to come back. Fight for board control!